Three years after making a successful, platinum side trip with her Latin Grammy-winning Spanish language collection Mi Plan, Nelly Furtado found a clever and intimate way to make sure fans of her three previous hit albums would be on board for her new Interscope album The Spirit Indestructible, due June 19. Building anticipation week by week and mysteriously referring to the project as “TSI,” she shot and posted on her website and YouTube over 15 black & white videos featuring key moments from the recording sessions, plus interviews with her and some of the heavyweight producers involved. The Canadian-born singer/songwriter recently released the Rodney Jerkins produced lead single “Big Hoops (Bigger The Better)”. True to the title theme of the new recording, Furtado has enjoyed an eclectic career as a recording artist, actress and philanthropist since scoring the Grammy-winning 2001 Top 10 hit “I’m Like A Bird” from her debut album Whoa, Nelly! By embracing different cultures and genres, and stirring up her sonic palette with an eclectic slate of producers (from Mike Elizondo to Timbaland and Rick Nowels), she has helped define musical diversity for a new generation. She followed her debut, which spawned four singles (including the hit “Turn Off The Light”), with her 2003 gold album Folklore, whose track “Forca” became the official anthem of the 2004 European Cup Football Championship. Her next release Loose (2006) sold over 10 million units worldwide and its two Billboard #1 pop singles earned Furtado Grammy nominations for Best Pop Collaboration with Vocals (“Promiscuous”) and Best Female Pop Vocal Performance (“Say It Right”). Partially inspired by her Portuguese heritage–her parents were immigrants from the Azores–the singer began writing her next album in English and Portuguese but later switched to Spanish and recorded Mi Plan, which reached #1 on the U.S. Latin Billboard chart, swept Canada’s Juno Awards with five wins (including Album of the Year) and won a Latin Grammy for Best Female Pop Vocal Album in 2010. Towards the end of the Spanish sessions with Salaam Remi (whose credits include Amy Winehouse, Nas and Fergie), the two wrote and recorded an English language track together–which led them to work on more tracks that ultimately found their way onto The Spirit Indestructible. 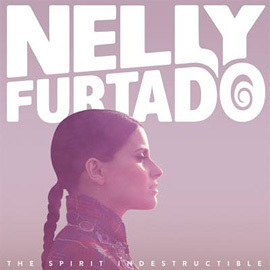 The cover of Nelly Furtado’s album The Spirit Indestructible. Other songwriter/producer heavyweights that Furtado vibes with on the new album include Rodney Jerkins (Michael Jackson, Beyonce, Lady Gaga); veteran metal producer Bob Rock (Metallica), who according to one posted video inspired ‘butterflies’ in her before she met him; Dutch DJ and EDM producer Tiesto, who she claims is the only electronics master whose live concert made her cry; rock producer John Shanks; and Jamaican reggae producer Da Genius. A deluxe version of the album will feature several bonus tracks, including Furtado’s collaborations with Fraser T. Smith (Adele, Cee-Lo), producer and Passion Pit lead singer Mike Angelakos, and a track featuring the Kenyan Boys Choir that Furtado produced herself. Other guests include rapper ACE Primo and Portuguese world music singer Sara Tavares.